Good Saturday morning, y’all! Hope you’re already enjoying your weekend, and doing lots of amazing things. So far, I’ve Body Attacked, had a fantastic double date with my workout buddy (and mistress of the killer workout, the Death Deck, Melissa) and her guy, and snacked heavily on some froyo and some quality brewskis. But more on that, later. See, right now, I have something to talk about that’s been on my mind for the past two days but, as I was swamped at work/working overtime to make up for coming in late on Monday, I had little/no time to blog, tweet, facebook, gchat, or any other fun social media that I love. But now it’s time. A few days ago, an article came out and swam around the twittersphere. The article, from New Zealand’s The Marlsborough Press, was entitled Women and Beer: The taste test results are in. To sum up the article, a sort of experiment was conducted inviting women who don’t normally drink beer to come out and try two new beers which have been specifically designed to appeal to the ladies. 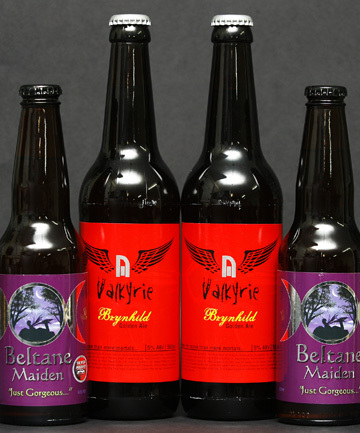 The next beer they tasted was called Valkyrie Brynhild golden ale, which was described as “gentle hopped” and flavored with “hokey pokey” (I have no clue what that means, but I heard that’s what it’s all about…) Again, mixed results ranging from “I’d choose this over a glass of wine” to “drinkable, not too much taste.” No real winner here, either. The author of this article, Geoff Griggs (who some of you may know if you spend a lotta time going to beer tastings in New Zealand) found that, when polling the women afterwards, and asking what it is about beer that women don’t like, the answers ranged from taste to the “bloated” and “gassy” feelings they get. Others focused on the image of beer drinking, traditionally associated with young males getting obliterated at parties. the women are merely accessories are prizes sought by the likes of (yuck) Carlos Mencia and friends. It is no wonder that women find the image of beer drinking a bit off-putting. One beer manufacturer is even trying to combat this stereotype with “Chick Beer“. I'll take sexist bottle designs for 800. Chick Beer finally gives women a beer choice that suits their tastes and their style. The bottle is designed to reflect the beautiful shape of a woman in a little black dress. The six-pack looks like you are carrying your beer in a hip stylish, purse. Chick’s unique reflective bottle blings you up! It’s fun, fabulous, and female! Ok, we get it. Lots of times, girls like to shop, to wear dresses, and to have jewelry. But I have to admit, this beer makes me feel like my fondness for shiny things (Seriously, I’m like a raccoon around Swarovski ) is being mocked, and then sold back to me. This beer truly just sounds like a flavorless, low carbonated light beer. And there are enough of them to go around. As a lady of lager (pulled that one from the Girls Pint Out description!!) myself, I have to say that this was an incredibly interesting look into why my breed is a rare one indeed. Likely, many of them only remember beers from the days of college or partying, where they were hoisted up for kegstands of warm, cheap light beer or were tossed a can of some swill. It’s no wonder, then, that they shifted their interest to the more “refined” wine. I'll have you know, this was a kegstand of Carolina Brewery Amber Ale. GET ON MY LEVEL! Bottoms up to Craft Beer, ladies! There’s a world of beer out there, just waiting for you to give it a try. And even though the bottles may not look like little black dresses or “bling you out”, I promise there are some pretty ones out there that can match just about any outfit you put together. Good post! I’m not a huge beer drinker, mainly because it upsets my stomach when I drink it :(. However, I think it’s weird that they are creating blinged out beers for women- and I agree that people do just need to be more educated about what is already out there! Isn’t chick beer basically just Mike’s Hard Lemonade anyways? Girls who dont drink beer will never drink beer ever. Silly marketers. Some solid points here! It is so irritating the way beer is marketed towards women. I am not the biggest beer drinker, but when I do drink one, I don’t want some watered down, low cal version of beer- even though I do watch my intake. Mill street beers (made here in Toronto) are currently my go to. Do they have them in the States? I have honestly never in my life seen Mill Street beers, but I just looked up their brewery and it looks like some quality brews! Again work won’t let me link to a site that has the word “beer” on it but my boyf and I were reading up on beer scores the other day. Basically it tells you how much alcohol you get per ounce and per carb (some strange equation)…. Beck’s light came out on top (way above the others) with the best beer score but this of course did not take into consideration most craft beers. But when you drink craft beers you don’t want to be fussing about calories like a lotta women do, you just want to be enjoying it for what it is. Ahh! Some girls will come around….. but I agree, the marketing techniques stink. Also, I was just thinking this morning that I’ve likely consumed more calories from beer this week than from breakfast…. woops. It’s been a big beer week. Taking next week off, pre best friend wedding…. Gotta look smoking in that MOH dress. Good post. There is a gap there in the market for more beers that will bring in more Women to Beer, and though Clear bottles have made beers such as Corona more accessible in the US/Canada and I’m assuming in Australia as Import Mexican beers are up all over the world. One of the biggest issues I see with many beers in brewpubs is glassware as beer tastes better out of Tulip glasses or Goblets like the Belgium brewers use, and I definitely feel certain styles of beer in glass would be more attractive to more females. I think it’s more of an education issue than anything else. I know ladies who swear they hate beer but enjoy Woodchuck’s Pear or Apple cider, which as anyone whose tried it would tell you is not unlike many styles of beer. The truth is, the diversity of beer out there, and the ability to combine it – as you noted – with food in an interesting way means no beer should go unappreciated. For all the ladies who are basing their beer dislike on Bud or “the champagne of beers” or, god forbid, PBR, there needs to be a massive intervention that walks them up to the bar and puts a fresh Guinness in their hands. And I’d be all for a “chick” beer that did that. Sadly, assuming the female beer audience will only like fruity, lite beers is once again underestimating us. It would be interesting to have some beer nerds (male or female) evaluate those beers in question without knowledge that they were marketed towards women. I wonder if stronger beers would be a suitable alternative, maybe even barely wine. Wouldn’t that cut down on the guzzling and bloating? Hmm…. barley wine, to me, isn’t even in the same realm, but I’d be interested to know how average ladies receive it. That would DEF cut down on the bloating, I bet, but might possibly add to the wasted-face-ness…. trade off? I’d LOVE to try the beers in question, will have to keep my eyes peeled next time I’m at a specialty shop. Chick beer??? Makes me want to vomit!! great post! My favorites are porters and lagers, so I guess these beer makers think I’m basically a man. That’s cool, I’ll just use the extra 10% I must get in my paycheck and buy something better. I’m of a rare breed too. I actually didn’t even think I liked beer in college (I followed the masses and just drank everything with ‘light’ in the title, until I realized ‘light’ meant zero flavor) Now, I’m obsessed with good beer and it’s really my drink of choice. It has to be a good craft brown ale and the darker, the better. I say f’ this beer and all the other top beer makers that market towards men. I’ll take my local hand craft beer any day of the week. You can also hold off on serving me a fruity girly drink, lord knows I’m not drinking that either. In all seriousness, I’m a total NON-beer drinker — but oftentimes wish I was. I’m sure my husband would appreciate sharing a pitcher w/ me of some local brews now and then 🙂 I’m only 27 so there’s always time!